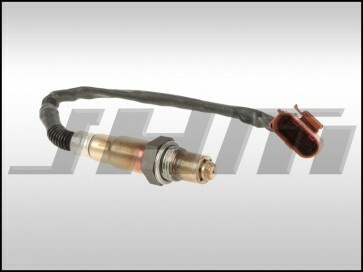 This is a brand new, high-quality, OEM Bosch oxygen sensor (or O2) for your B7-RS4 or B8-S5 with the 4.2L V8 FSI. This rear oxygen sensor will fit either the driver or passenger side of your S5. If you need to replace both rear oxygen sensors, be sure to change your quantity to "2" before adding this part to your cart. If you have codes in your ECU for "Oxygen (Lambda) Sensor BX S2" (where "X" is either 1 or 2) showing a bad heater circuit, short to ground, or signal too low you could have a bad rear oxygen sensor that needs to be replaced. If you have questions about the codes in your car, don't hesitate to give us a call or send us an email, we'd be happy to try to help you diagnose the issue. Please note that when diagnosing your vehicle Bank 1 or B1 is the passenger or right side of the motor, Bank 2 or B2 is the driver side or left side of the motor, S1 is the primary or front sensor, and S2 is the secondary or rear sensor.